Baby Rhino Lizzie at Baby Rhino Rescue | Adopt and Donate Now! Lizzie’s mother was poached in August 2015. 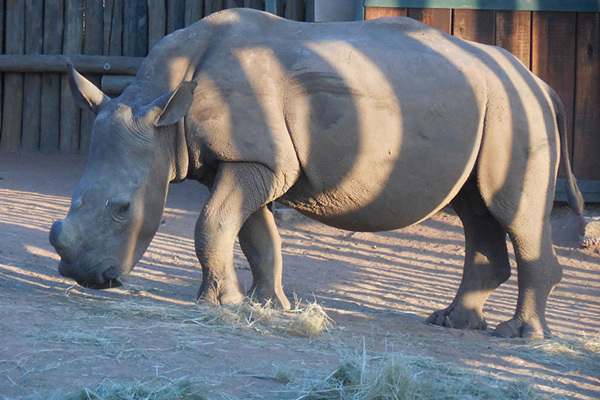 She arrived at Rhino Pride when she was 6 months old. Lizzie is two years old now, but remains one gentle rhino. She no longer drinks milk, so she is free to wander getting all her nutrients from grazing. Her best friends are Monty and PJ. The three rhinos are always together, and enjoy a deep, rhino bond. It is beautiful to see them walking, grazing, and napping together. This is called “a crash”-- it’s how rhinos naturally love to be. They are social and very family oriented animals. It is always wonderful when orphan rhinos find a new crash, and feel that family warmth again.